Trunch is situated close to the North Norfolk coast, just 1.2km from Mundesley, and the southwest of the parish is cut by Bradfield Beck. The name ‘Trunch’ is of uncertain origin, and may refer to the fact that Le Tronchet Abbey had possessions in Norfolk. Alternatively it may also have been derived from Celtic words for ‘woods on a promontory’. A small number of objects from the earliest periods of human occupation have been discovered, situated largely in the western side of the parish. These include a Mesolithic flaked axehead (NHER 6824), a Neolithic flaked axehead (NHER 24756) and some flint flakes (NHER 23262). A small hengiform monument (NHER 36492) of possible prehistoric date has also been recorded in the north of the parish, as has a possible Neolithic enclosure (NHER 27291) just north of the village. A small number of possible Bronze Age ring ditched (NHER 40941) have also been noted, along with some pottery sherds (NHER 6826). Although no objects from the Iron Age have been recovered, there are two possible settlements noted (NHER 11867, NHER 21128), as well as a trackway (NHER 39061) and possible barrows (NHER 13078) that may date to the Iron Age or Roman period. Unfortunately this parish has seen very little metal detector activity, and there are no recorded Roman objects, and the only objects from the Saxon period are some pottery sherds (NHER 6825) from an area to the west of the village. Although the reference to Trunch in the Domesday Book is small, and the parish does not have a particularly large value, it is listed as possessing a church, which is almost certainly the church dedicated to St Botolph (NHER 6852) that stands today. It is a large building of flints with stone details, and is one of the most interesting in the local area. Outside, the church is largely 15th century, built in the Perpendicular style, with a tower that starts off strong and diminishes in four stages to finish in a simple and understated bell stage. 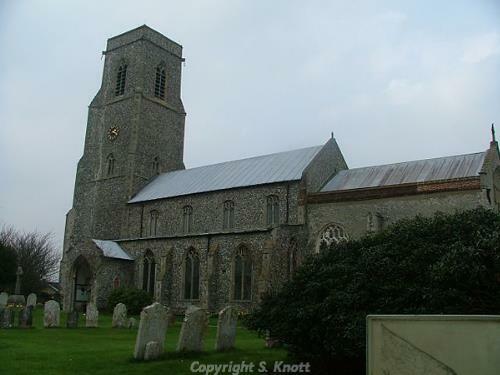 Inside, the church contains one of the most exciting ecclesiastical treasures in Norfolk. This of course is the stunning font canopy, constructed in the early 16th century, on the very eve of the Reformation. Only three of the canopies surviving across the country rival this one, which is particularly valuable as it gives us a glimpse of what English Catholic art was developing into at this time. 16th century Trunch Hall (NHER 22861) is the only other building that may date to the medieval period, although there is any area to the west of the village that may have been a medieval pottery production site (NHER 6825). Also of possible medieval or post medieval date are a number of field boundaries (NHER 39046) visible as cropmarks on aerial photographs of a field to the northeast of the village. Medieval finds are also rare, limited to a small number of pottery sherds (NHER 45398, NHER 22974). Only a single sixpence from 1592 (NHER 30848) has been recovered from the post medieval period. However, there are a number of post medieval buildings, as well as the site of a post medieval brickyard (NHER 15855). A possible post medieval enclosure (NHER 39060) has been noted in the very north of the parish, as well as some field boundaries just outside the village itself. There are also a number of buildings of architectural interest, situated almost exclusively on Mundesley Road, in the eastern part of the village. 17th century Ivy Farmhouse and its associated barns (NHER 6850) are a good example of these, as is Brick Kiln Farmhouse, also of the 17th century. Also of interest is a rare World War One pillbox (NHER 18468), situated on the Trunch Road, just 100m from the eastern edge of the parish. Ruth Fillery-Travis (NLA), 28 February 2007. Mortlock D. P. & Roberts, C. V., 1981. The Popular Guide to Norfolk Churches No. 1, North-East Norfolk, Acorn Editions.